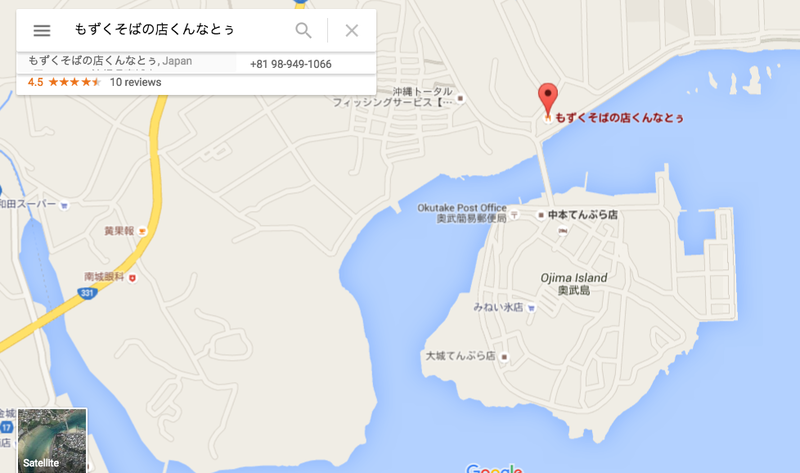 Dear readers, you must be getting sick of post after post about Okinawa. Yeah yeah, another beach, another bowl of delicious looking noodles, another day in paradise. But I just can’t help it. Okinawa has become our second home. When we arrive in the airport and step out into the sunshine and take a deep breath, my husband and I smile and say to each other, ‘Tadaima!’ which is the traditional Japanese way of saying, I’m home! 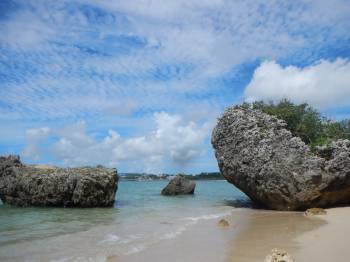 It almost feels like Okinawa is our real home, and Hong Kong is…. well… the place where we happen to live. I’m learning there’s a big difference. This time we stayed in an Airbnb in Nanjo, a quiet seaside town about 30 minutes east of the capital Naha. Like a lot of rural towns, there is a surplus of natural beauty, but a bit of a lack of entertainment in terms of restaurants and izakayas. Nonetheless, if all you want to do is chill on the beach, take midday naps, and enjoy an afternoon drive, then Nanjo might suit you just fine. As is so common in Japan, the government wants to control nature by every means possible. So Azama San-San beach is government-run, with paid parking, shower facilities, lifeguards, shark nets and what not. It’s kind of like Pigeon Point. It’s incredibly beautiful and the water is perfect (and no doubt raked every morning to pick up trash), but I’m not a fan of artificial beaches because of one annoying thing in particular – noise pollution! I can’t stand going to a beach in Japan and they are playing some peppy J-pop song at full volume. All I want to do is hear the sound of the waves and the feel the movement of the sea but instead I’m hearing some high-pitched girly-girly singing a crappy kawaii song. Ugh. Who has the right to impose this on people trying to enjoy nature?! Mibaru Beach on the other hand is a long, long stretch of sand, so we found a quiet turn off the road where we could park – for free – and walk down. On the beach we found a lady walking her two Jack Russel terriers and chatted briefly with her. She said this was the area where the locals go, not the tourists. 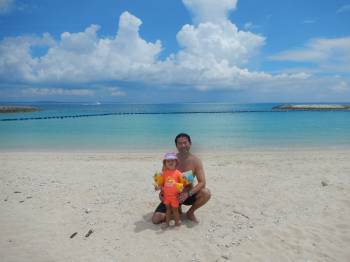 We had the beach to ourselves, and yes, it isn’t the turquoise waters and imported white-sand of Azama San-San beach, but I still prefer a real, normal, natural beach any day. On the southern tip of Nanjo is the tiny but picturesque O-Jima (O Island), a little fishing town with lovely little beaches which I’ll definitely go back to. Squid drying in the sun, stalls selling fish tempura, grandpas fixing their greased up fishing boats on the beach… it was quite interesting. 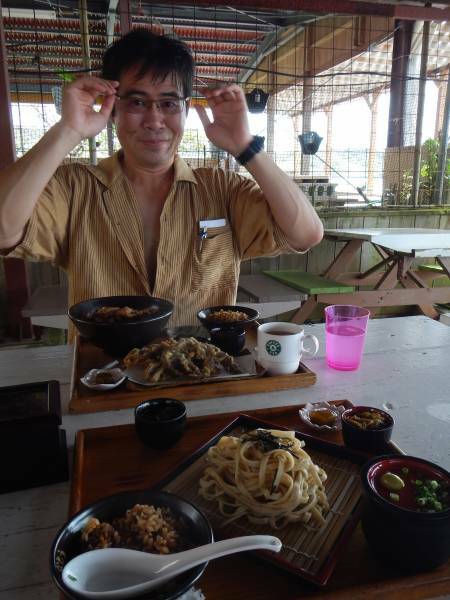 There was an amazing soba restaurant just before you cross the bridge onto the island, which offered ginormous lunches with an unlimited supply of mozuku, the local seaweed and a popular dish in Okinawa cuisine. Really yummy. Later, while driving around looking for a supermarket, we spotted a beachside park to let the kid run around, and happened to run into two young ladies in blue yukata carrying the local instrument, sansen (literally, three strings. They had just finished filming a music video on the beach, and had uploaded it to YouTube. That night when we got home we looked them up and found their video. 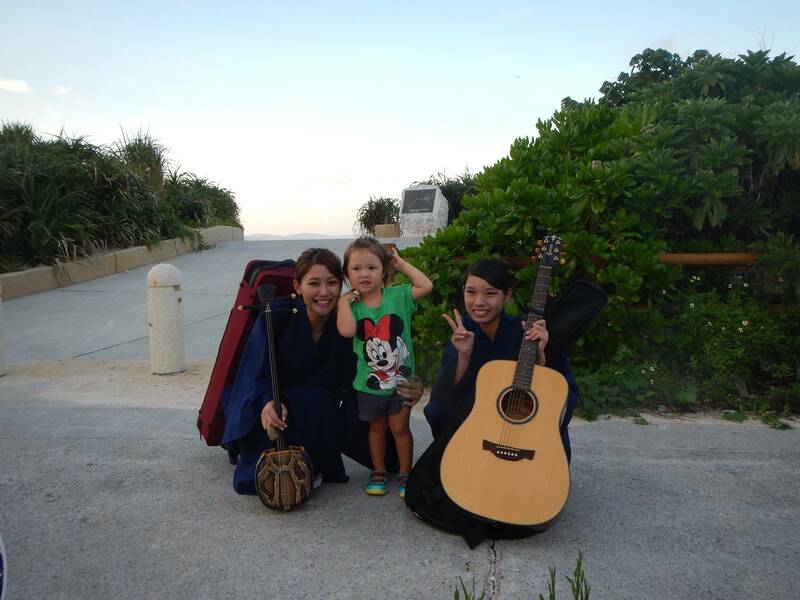 If you want to hear some local Okinawa music, here’s your chance to see two budding young musicians. Hope they make it big one day! There is a lot more to see in Nanjo but with only three nights we were pressed for time. Four days is never nearly enough! Not to worry, we’ll be back again soon enough.